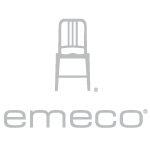 Emeco is defined by the Navy chair, which was produced in the 1940s for American warships. Made from scrap aluminum that was enhanced to make the material more resilient, the chair was designed to withstand life at sea. After the war, the brand gained popularity on land among European architects and designers, including Philippe Starck, who helped to expand the collection in the early 2000s. The original Navy chair is still in production and is available in recycled aluminum and now recycled Coca-Cola bottles.